In rural areas, especially those susceptible to bushfires, it’s essential to protect everything that’s important – your family, your home and your stock. Part of being prepared means having a plan in the event of danger, taking steps to organise and maintain your property and having sufficient water storage on site. Aquamate’s range of galvanised steel water storage tanks are ideally suited to providing protection for homes and sheds in bushfire prone areas. Speak to us about the benefits of a galvanised tank for fire protection. Keep a high-flow firefighting pump on hand. Make sure to test and maintain your pump at least every year. Consider installing a sprinkler system and reserve fire tank. When connecting a fire pump or sprinkler system to a fire tank, carefully consider the amount of water you will need. A 400 litre-per-minute fire pump will completely drain a 20,000L tank in just under an hour. For more industrial fire protection applications, like dedicated fire hydrants or automatic sprinkler systems, jump across to our water tanks for commercial fire services page to find out more. Fire tanks need to withstand the different types of heat and flame conditions during a bushfire. Red-hot ambers from leaf litter or ones blow during high winds can affect the performance of your fire tank, as well as radiant heat from approaching fire and direct expose to flames. Poly tanks are typically made from polyethylene, a ductile thermoplastic that can be melted to be re-formed again and again – that’s what makes it such a great material for recycling. Under the stress of radiant heat exposure, combined with the stress of holding water, poly tanks can become unstable, beginning to sag and split. The transition temperature for polyethylene, the point at which it starts to soften, is just above the temperature of boiling water. Even when exposed to ambers, poly tanks can start to blister around the base. Galvanised tanks come in two types; rolled galvanised tanks with an for small volumes around 10,000L to 20,000L and bolted liner tanks for 25,000L and up. Even when exposed directly to flames, Aquamate’s liner tanks continue to be effective. Under direct flame, the exposed sections of liner above the water line will melt, but because the liner material floats, the galvanised tank can continue to hold the majority of its water until empty. Research and Testing undertaken by the Bushfire Cooperative Research Centre (now Bushfire and Natural Hazards CRC) into the use of both poly and galvanised steel tanks has shown that galvanised steel water storage tanks have the best chance of providing effective bushfire protection for your property. For small water storage volumes, 20,000L and less, you can contact Aquamate and we can put you in touch with one of our dealers that supply galvanised tanks. Alternatively, feel free to search for a dealer in your area and see what they can offer you in a galvanised tank, especially if you’re in a bushfire prone area. With over 30 years of experience, you can trust we will provide a fire tank that will protect for years to come. Once you’ve decided that you want a fire tank, consider whether you want to take advantage of the fire tank volume for more than just bushfire protection. 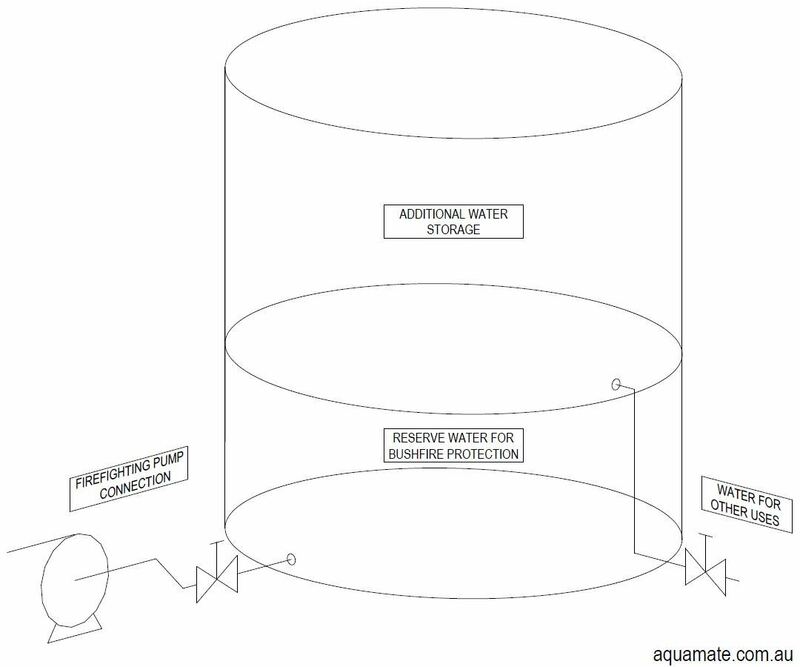 Aquamate can combine your rainwater harvesting for irrigation or domestic uses without cutting into firefighting reserve water. By installing your bushfire take-off at the bottom of the fire tank and a second take-off above the reserve volume water line, Aquamate can combine the two storage volumes, without you having to worry about accidentally depleting the firefighting reserve. Additional water storage can be used for anything from garden irrigation systems, laundry and bathrooms, to supplementing or replacing your entire domestic water use. Plus, with Aquamate’s “Rainsaver” gutter system, you can collect rainwater that’d normally go to waste directly off the roof of the fire tank. Increasing the size of your fire tank works out cheaper than purchasing a second tank for other uses in almost all cases. Today, Aquamate’s range of fire tanks is available in a variety of sizes from 23,900 litres right up to 275,800 litres. All of Aquamate’s fire tanks in the range are transported to site in “flat pack” form and assembled on site within a single day in most cases. All fire tank models are available in a uncoloured galvanised finish and a variety of modern colours. Have a look at Aquamate’s colour selector to find a colour that suits you. Want more information on bushfire preparation and storage tanks for your home ?